Use the e-mail address that you check the most often! I *only* send an e-mail when a truly great deal comes out from Kelowna. Your address will never be used for any other purpose. I hate SPAM too. If you 'Like' the fan page my deals will show up in your Facebook news feed. 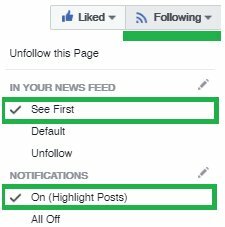 TIP: Immediately after you have 'Liked' the page, click on 'Following' and set the option to 'See First' as shown in the image. This way, you will be sure to see a new deal when it's posted. Otherwise, you are at the mercy of Facebook as to when you see the deals (sometimes too late). Follow @YLWdeals on Twitter for new deals, and for deal updates. Join thousands of other people from Kelowna in the Facebook Group to discuss the latest deals, and get amazing travel advice. Click the 'Join Group' button when you arrive. Add the feed to your favorite RSS reader!